Click on the chart above, to download a PDF version of the chart. The Office of the Assistant Secretary of Defense for Acquisition (OASD(A)) provides oversight and policy direction to the Secretary, Deputy Secretary, and Under Secretary of Defense (Acquisition and Sustainment) on matters relating to DoD's acquisition system. 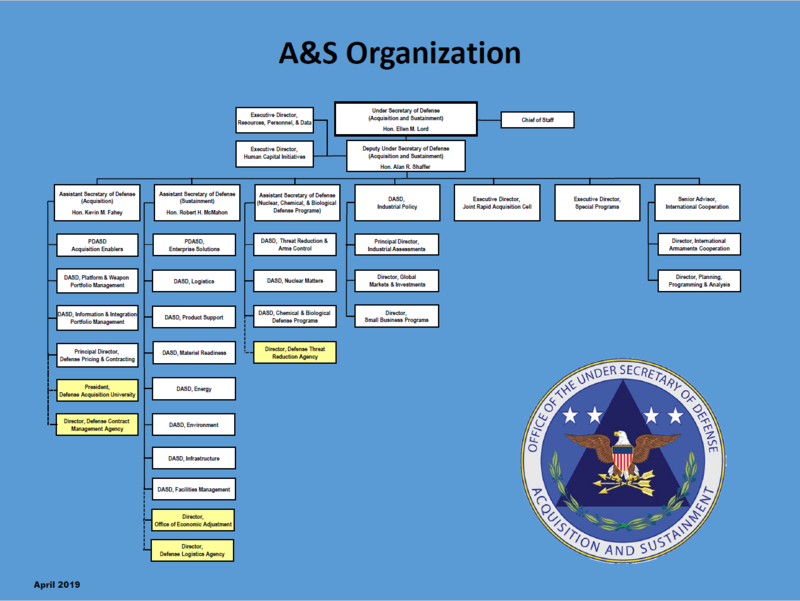 The Office of the Assistant Secretary of Defense for Sustainment (ASD(Sustainment)) serves as the principal staff assistant and advisor to the Under Secretary of Defense for Acquisition & Sustainment (USD(A&S)), Deputy Secretary of Defense (DEPSECDEF), and Secretary of Defense (SECDEF) on logistics and materiel readiness in the Department of Defense (DoD) and is the principal logistics official within the senior management of the DoD. The Office of the Assistant Secretary of Defense for Nuclear, Chemical, and Biological Defense Programs (NCB) develops policies, provides advice, and makes recommendations on nuclear weapons; chemical, biological, radiological, and nuclear (CBRN) medical and non-medical defense; safety, surety, security, and safe destruction of the current chemical weapons stockpile; nuclear, chemical, and biological arms control activities; and related plans and programs. The Office of the Deputy Assistant Secretary of Defense for Industrial Policy office supports the Under Secretary of Defense for Acquisition and Sustainment by providing detailed analyses and in-depth understanding of the increasingly global, commercial, and financially complex industrial supply chain essential to our national defense. The Joint Rapid Acquisition Cell provides a single point of contact in the Office of the Secretary of Defense (OSD) for tracking the timeliness of immediate war-fighter need actions for the senior leadership and facilitating coordination with other government agencies.